Warning: The misuse of a laser light can cause serious damage. Never point the light into the eyes of your pet or another human. Bentley went nuts over it. We run it along the floor throughout the house while he chases it. 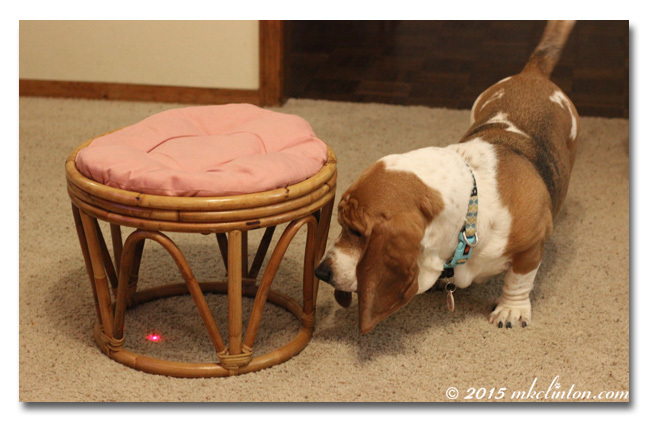 When we are through playing, we “pick the light up” where he can see it and put it on the fireplace mantel. Every time that we go into the living room, he runs over to the hearth and stares up at the mantel. When we reach for it, he begins barking and bouncing like a puppy. This happens all day long. The boy is obsessed with the laser light. Is there a Laser Lovers Anonymous that he can join? We are joining our friends at BlogPaws for their Wordless Wednesday blog hop. Discover more fun with these other "hopping" blogs. Haha those things are so much fun! I got a laser light for our cat and she had no interest in it! Thanks for reminding me though, because Luke did love it, and I haven't gotten it out for a while. That could be a great way to get him some exercise when we're stuck indoors. Such great focus. Have a great day. Hmmm, I am with Pierre...I was not interested in the laser light at all. I would rather chase a critter! I'm glad Bentley is having a great time chasing it though. What a silly dog. Haley loves it too, but I don't use it that often or for very long because she could get obsessed over it. Like Bentley, she understands where the light comes from, but she would run herself to death chasing it. To each his own. Glad he likes it! My dogs pay no attention to them but my cats? OMG watch out! They will climb walls for that red dot! hahaha! We had one some years ago and Bailey loved it! BOL!! Go Bentley!! Mama gave hers away after Addie cat went over the Bridge...Maybe she should get one for us to try out!! it is denny's favorite too - but do know dogs can really get obsessed with them. Mommy came home from Blog Paws with one of those! We never had one before and she thought it would be interesting to try. Well, my sister Lexy LOVES it!!! Mommy never saw her run so much ever! It's good, because she's a little chunky. I use a laser light with my cat, Kisa. She loves it. For Bain, I believe he'd become a obsessive about it unfortunately! Mom let me chase a laser once but then I went crazy. After checking it out she found out it in not good for dogs with high prey instincts. We love chasing the red dot! One day we're gonna catch it. ;) We never realized woofies like the red dot too. Laser Lovers Anonymous is a great idea. Mister Cat would be the first to join!